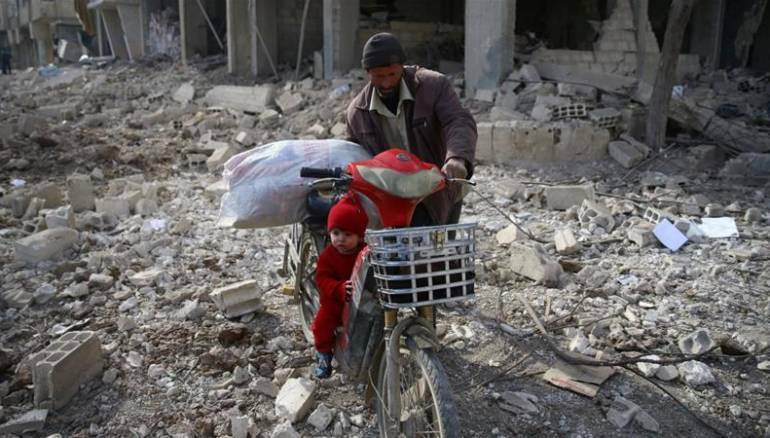 During the regime offensive to retake eastern Ghouta, 1,700 civilians were killed and there was extensive damage to infrastructure writes Zaman Al Wasl. It has been seven months since eastern Ghouta fell to the regime but living conditions and public services have not improved, residents say. The eastern enclave of Damascus is largely neglected by the government, and this neglect has negatively affected the lives of the people and their opportunities for resettlement in the area. Naim al-Taweel, pseudonym, an activist living in the Marj district says most of the health centers suffer from a lack of equipment and medical staff. Most families in Marj depend on car batteries and small chargers to light their homes at night. People have to get water from the wells they have dug, he added. The fall of eastern Ghouta last April was achieved in a brutal fashion and changed the course of the war. More than 1,700 civilians were reportedly killed during the eight-week offensive. Eastern Ghouta was the scene of the first major protests in the capital against the rule of Bashar al-Assad. Diab Hamo, resident in Bala suburb, said most of the people feel that they are still living under the siege that was imposed by the regime on Ghouta for 6 years. In November, the regime intelligence launched a wide-scale arrest campaign in the eastern suburbs, seizing former rebel fighters. The notorious Air Force Intelligence has arrested former fighters from Jaish al-Islam and Faylaq al-Rahman rebel groups. Also, the General Conscription Department has sent demands to 3000 young men to perform the military service. Most young men in the capital’s eastern suburbs have rejected the regime’s conscription call, but the reconciliation deals have imposed a new de-facto. They must join the army or face being arrested by military intelligence. The regime is trying to attract more young men who are outside Syria by enacting laws and regulations that encourage them to return home, and enroll in mandatory and reserve services. More than 125,000 pro-regime soldiers have been killed during seven years of brutal war, according to local monitoring groups.